Bottom line�Performance...performance...performance! Need we say more? Magnaflow has been creating power packed performance exhaust systems for years. Add this top of the line exhaust to your Dodge Charger for maximum driving pleasure. This is the perfect horsepower maximizing upgrade for your car. Let your Caliber's engine really churn out the power with a free-flowing stainless steel exhaust system from Magnaflow. Each system comes with pre-installed hangers and can be installed on your car in about 45 minutes using common tools in your driveway. The Magnaflow muffler is encased in an all stainless steel body and also features stainless steel end caps and perforated core. This steel reflects heat and resists corrosion better than cold-rolled steel. It also retains the finish longer, adding to Magnaflow`s long life and clean appearance. Packed between the steel mesh and the steel shell is a high temperature acoustical absorbing material. 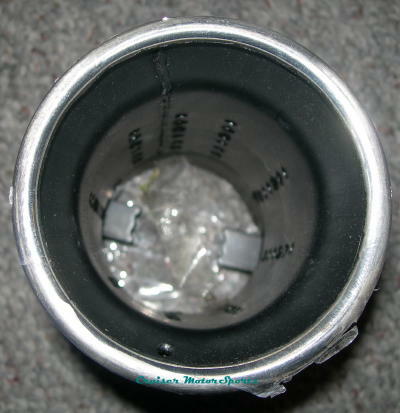 This dense wall of fiber filters out the harsh exhaust vibrations producing Magnaflow`s rich, powerful, performance tone. This tone offers a deep basey sound when throttling while remaining quite during idle and highway speeds. The core is wrapped with stainless steel mesh that warms up quickly and maintains the muffler`s optimal temperature for exhaust movement. The mesh creates a porous barrier that allows sound vibrations to pass freely into the acoustical absorbing material inside yet prevents blowout and deterioration of the absorbing material. The 1/2" overlapped metal-to-metal construction is used on all mufflers. This 1/2" overlap of steel occurs at every joint, creating a stronger surface-to-surface bond than mufflers employing only a rolled edge joint. The lap-joint is completed using a smooth, continuous MIG weld that seals the system and further strengthens the joint. Magnaflow�s one piece perforated stainless steel core lets exhaust gasses fly right through. Nothing gets in the way to slow them down. You won�t find any pressed-in louvers causing turbulence here. No louvers. No baffles. No sharp turns. Magnaflow�s straight-through design improves exhaust flow to increase torque and horsepower. Mopar cat-back exhausts by Borla feature patented, straight-through and multicore technology to unleash hidden horsepower. Increased exhaust velocity adds power, driving excitement, fuel economy, and the distinctive Borla sound of power respected by motoring enthusiasts everywhere. Each system is built from premium, aircraft-quality T-304 stainless steel�an alloy superior to T-400 series knockoffs�to give you the absolute best in performance and durability. Ultrasmooth mandrel bends ensure maximum flow and power, and precision computer-controlled CNC manufacturing ensures an accurate fit. This free-flow system provides horsepower and torque gains, improved fuel economy, and a deeper exhaust note. Features dual split rear chrome exhaust tips. 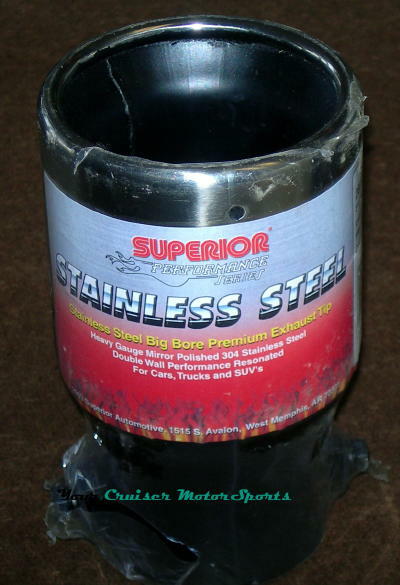 Exhaust Tip, 3 1/2" X 6", Stainless Steel Round. Bolt on or spot weld. This tip has a built in resonator inside the tip.